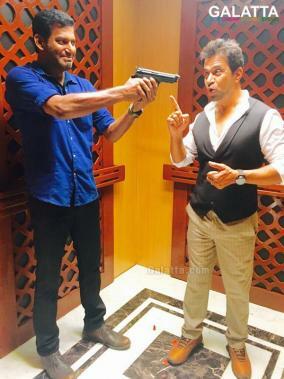 The Vishal starrer, Irumbu Thirai, has finally made it to screens today after the film, which was initially slated for a release a while back. The cyber crime thriller is gaining a positive response among fans with many showering praises for the story and the representation of 'Digital India' on the big screen. With the film now out, Vishal took to his Twitter page to convey his gratitude to all those people who had stood by him during all the hurdles the entire team had overcome over the course of production and post-production. /2 my bro Praveen n finally da reason y Am an actor.dis lovely audience.yes it is #aadharcard #DigitalIndia.I won't budge to tell the truth. Thank u all.Will sleep for a while now. Peacefully. Mithran George n my lovely team. @Samanthaprabhu2 I won't thank u.was our team effort. Irumbu Thirai features actress Samantha playing the female lead opposite Vishal for the first time in her career in this PS Mithran directorial produced under the Vishal Film Factory banner. Actor Arjun’s role in the film is said to be a surprise delight and he propels the narrative forward. >> BREAKING: Vishal's Project Scrapped!